Nominated for 6 Oscars, including Best Picture and Best Actor. 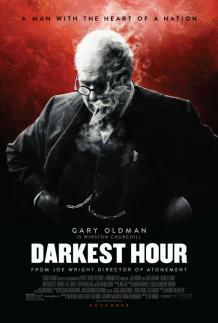 “Joe Wright directs this undeniably exciting and beguiling account of Winston Churchill’s darkest hour in 1940, as Hitler’s forces gather across the Channel, poised to invade. This is not so much a period war movie as a high-octane political thriller: May 1940 as House Of Cards, with the wartime Prime Minister up against a cabal of politicians who want to do him down. It’s interesting for a film to remind us that appeasement as an issue did not vanish the moment that Winston Churchill took over as Prime Minister, not everyone was right behind him, rolling up their sleeves. Here, his immediate enemies do not seem to be Hitler and Mussolini as much as Chamberlain and Halifax, agitating for a deal with the Nazis and scheming to undermine Churchill’s cabinet and parliamentary position.